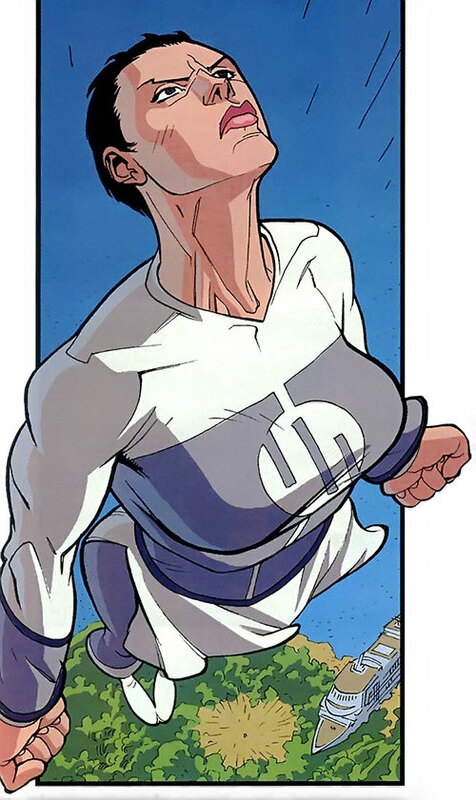 Anissa is a character from R. Kirkman’s super-hero comic book series Invincible. 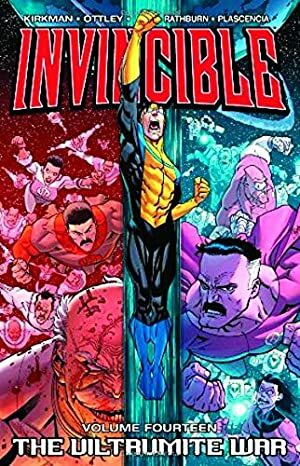 If you’re not familiar with it you’ll want to first read the profile for Invincible, and we suggest throwing in our Generic Viltrumite profile as well. Marital Status: Single (widow several times over). Base Of Operations: Mobile within the United States of America. 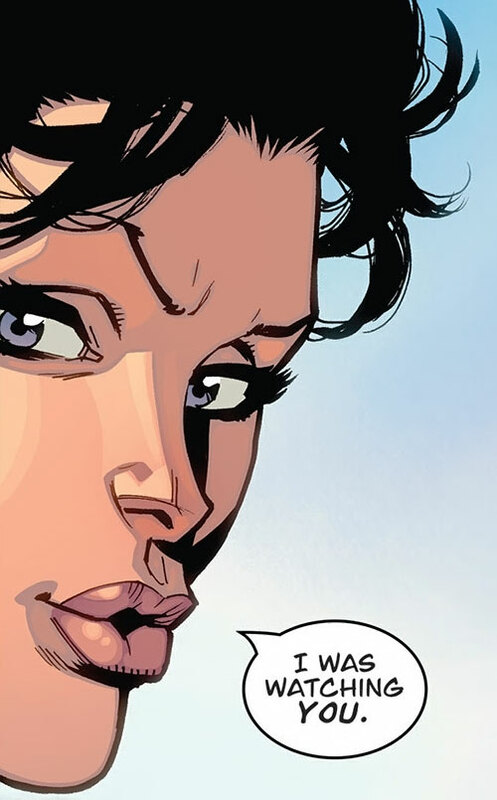 Anissa possesses the vast superhuman strength that one would expect to find in a Viltrumite woman of her age, height, weight and build who engages in intense regular exercise. Using the Marvel Handbook terminology, this places her strength level somewhere above the “Class 100+” range, which enables her to lift (press) weights far in excess of one hundred tons directly overhead. Anissa is one of the last living full-blooded Viltrumite women in the universe. Her alien biology grants her unbelievable superhuman strength, speed, durability, stamina and the gift of unaided flight. Anissa possesses these traits in quantities that dwarf those of all known earth-born heroes and heroines. Like all Viltrumites, Anissa ages at a mere fraction of the rate that humans do, and can fully expect to live for thousands of years as long as she doesn’t meet an unexpected and violent end. Outside of her melee prowess (Anissa is a seasoned warrior of the Viltrumite Empire and has been involved in combat for over one thousand years), Anissa is a skilled orator (when she wants to be) and possesses a layman’s understanding of Viltrumite technology and astrogation. The bioengineered Scourge Virus (which decimated the Viltrumite race). Anissa has survived exposure to the original Scourge Virus, and is presumably immune to that specific strain. Finally, Anissa suffers from an acute form of a rare behavioural disorder known as Intermittent Explosive Disorder (IED). It can be characterized by extreme expressions of anger, often to the point of uncontrollable rage, that are disproportionate to the situation at hand. In layman’s terms, it can take very little to cause a violent outburst from Anissa should she feel angry or frustrated. 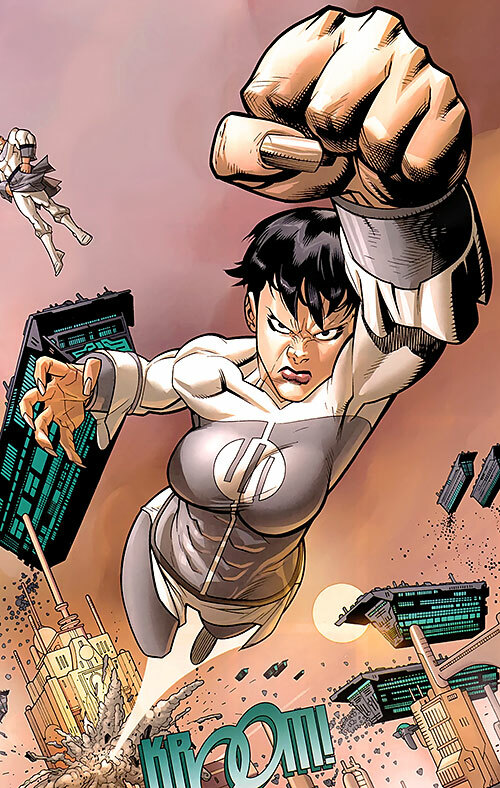 Anissa, a loyal member of the Viltrumite Empire, was first sent to the planet Earth in order to verify that Invincible was making progress in weakening the planet’s defences. When she arrived, she was disappointed to find that Invincible had literally taken no action towards completing his assigned task. Anissa sought out Invincible in his civilian identity and found him on his university campus with his mother. She coerced him into following her into the afternoon sky by threatening his mother’s life but when he arrived expecting a fight, she surprised him with an offer to talk. The two parlayed briefly, and Anissa explained how the coming Viltrumite invasion would be a good thing for the Earth and its inhabitants. She expounded on the virtues of their arrival and how it would eliminate sickness, greed and want amongst the people of Earth. When Invincible countered that its people would be treated as pets, Anissa didn’t deny his assertion. The conversation seemed to be approaching a stalemate, when Cecil Stedman interrupted it with a mission for Invincible. A gigantic sea-monster was attacking a cruise ship and its passengers were in desperate need of aid. 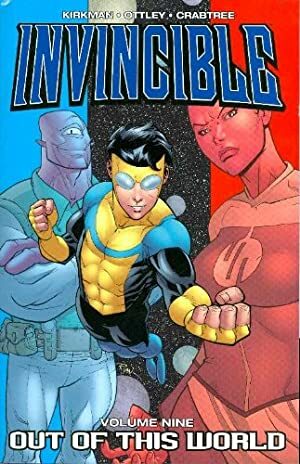 When Invincible attempted to break off the conversation, Anissa took the opportunity to try and prove her sincerity and accompanied him to face the monster. When they arrived, Anissa murdered the creature with a single herculean blow and then helped Invincible tow the damaged ship to safety. With the immediate threat abated, Anissa hoped that her aid would have convinced Invincible to change his world view and join the Viltrumite cause. When Invincible remained unmoved by her efforts, Anissa (unable to control her frustration) attacked him in a fit of rage. In short order she had Invincible pinned and helpless on the ground. Fortunately for Invincible, Anissa managed to restrain her baser instincts and after leaving him with a warning that her people would return, soared skyward and into the darkness of space. After leaving the Earth, Anissa rendezvoused with General Kregg upon the Viltrumite carrier that had brought her to Earth. Despite their disappointment at her failure to convert Invincible to their cause, the two realized that they had plenty of time to change his mind. As the two Viltrumites left Earth space, they accidentally intercepted and captured Allen the Alien who had chosen that moment to return to Coalition Space from the Earth. Anissa next appeared during the events of the Viltrumite War, deep within Coalition space. The Viltrumites had been losing ground for several months once the Coalition realized that there were only 50 of them defending their entire empire. Grand Regent Thragg eventually came up with a plan to assail Talescria, the Coalition home world, directly. Anissa was a large part of those plans. When the assault was initiated, Anissa was one of a strike force of nearly 10 Viltrumites that ravaged the planet. Both she and General Kregg waged a savage personal battle against Thaedus (the Coalition leader), Allen the Alien and the earth born hero Tech Jacket. The three heroes of the Coalition seemed sure to lose, until the Grayson family (Omni-man, Invincible and Young Omni-man) arrived on the scene and managed to turn the tide. As the battle turned, Anissa fled in the darkness of space at the command of the Grand Regent Thragg. She returned to Viltrum with all of the remaining Viltrumites, in preparation for an all out assault against the Coalition forces. They had only been on the planet for a few hours when a small group of the most powerful members of the Coalition entered Viltrum’s airspace in the hopes of preparing an ambush for them. Thanks to the early warning of their approach provided by Thula (who had laid in wait amongst the dead bodies of her comrades), the Coalition forces were the ones who were caught up in an ambush. Anissa threw herself into the battle with abandon but quickly found herself stymied by the raw power of both Allen the Alien and the creature known only as Battle Beast. She herself was not one of the final casualties of the brutal fight, but a full 13 of the remaining Viltrumites were slain in the confrontation and the planet Viltrum itself was reduced to rubble. During the battle, Thragg was a dervish of destruction. He beheaded the Coalition leader Thaedus for his treachery, threw the leonine warrior Battle Beast into the blackness of space and literally maimed the Grayson family. It was only his desire to preserve the numbers of Viltrumites in the universe that made him spare the Graysons. Instead he abandoned the Graysons in deep space, and ordered his people to follow him to the Earth. Anissa dutifully followed. Of all of Thragg’s trusted lieutenants, Anissa had the hardest time adjusting to life on Earth. Thragg’s expectation (and order) was that his people go forward and multiply. Of course this would have required Anissa to copulate with human males and to have a baby. She had no desire to do either. Despite her urge to remain faithful to the Empire and its Grand Regent, Anissa could not bring herself to mate with the human population and/or bear a child. Anissa refusal to participate in Thragg’s plans frustrated the Viltrumite Lord, and she was patiently awaiting the punishment for her choice when Thragg accidentally revealed that the exiled Nolan was the heir of Argall, and thus the true ruler of the Viltrumite Empire. When Thragg attempted to murder Nolan, Anissa (along with Lucan, Kregg and Thula) intervened on Nolan’s behalf and nearly beat Thragg to death for his treachery. It was only Nolan’s direct order to spare Thragg’s life that stopped Anissa and the others from killing Thragg on the spot. At this time, Anissa appears to remain a faithful servant to the Viltrumite Empire, but her loyalty to its new Emperor has yet to be tested. Outwardly, Anissa appears to be a beautiful caucasian woman, with short cropped black hair and steely grey eyes. She is a statuesque woman. She stands far taller than the average woman, with broad muscular shoulders, well defined muscular arms and a thick chest. Unlike most woman with such builds, she also possesses an unusually well developed bust. Despite her obvious beauty, Anissa can initially be quite off-putting as her face is often contorted in anger and/or frustration. Anissa’s garb is typical of ranked adult Viltrumite soldier. It consists of a white and grey body stocking like garment, with a circular symbol with three vertical lines in the centre of her chest. Her pelvic region is covered by a simple white loin cloth and her feet are protected by a pair of sturdy white boots. In every way that counts, Anissa is a Viltrumite to the core. Her desires in life are influenced by three main ideas/concepts: utter loyalty to the Viltrumite Empire, physical strength above all else, and glory in battle. These three concepts are all that truly matters to her. This hasn’t altered at all during her time on the planet Earth. She hasn’t bothered to integrate with the human beings that surround her, and she tends to look upon them as lesser beings. This being said, Anissa is not psychotic or sociopathic by any means. In fact, Anissa’s assignment to initially convince Invincible of the Viltrumite’s benevolent intentions as well as Conquest’s comments to the similar, lead one to believe that Anissa’s weapon of choice is diplomacy when first approaching a potential member of the Viltrumite Empire, rather than simply ravaging the planet. One can only assume that if a planet’s people were willing to join the Viltrumite Empire peacefully, she would graciously accept their surrender and work diligently to improve the quality of their life. Whether or not this behaviour is due to a sense of benevolence on her behalf or a simple practicality about rebuilding a devastated planet is unknown at this time. “Don’t move. I’m stronger than you. I’m faster that you. And you better know I’m smarter than you. So don’t move. You so much as touch me and it’ll set me off. I told you what a nasty temper Viltrumites have. You piss me off — things will get nasty. Area Knowledge (Milky Way Galaxy), Familiarity (Viltrumite Technology), Lightning Reflexes, Near-Immortal (Potential Lifespan – 3000+ years), Stabilization. Attack Vulnerability (-2CS vs attacks against the inner ear), Exile (Viltrumite Empire, Involuntary), Fatal Vulnerability (Scourge Virus), Gradual Loss Vulnerability (Scourge Virus, All Powers to 0 APs and Physical Stats reduced to 02 APs, Rare), Loss Vulnerability (Klaxus Plant, All Powers and physical attributes reduced by 04 APS, Rare), Minor Rage, Secret Identity, SIA (Battle), SPI (Intermittent Explosive Disorder). TELEPATHIC EARPLUG [BODY 03, Comprehend Languages: 06, Telepathy: 06, R#: 2 ; Limitations: Comprehend Languages: Spoken Languages only; Telepathy: Communication only; Comprehend Languages and Telepathy only function in a Vacuum]. All Viltrumites suffer from this disorder which causes them to perform an action check against a Serious Rage whenever they begin to feel negative emotions (frustration, anger, fear) with failure resulting in immediate devastating physical violence. As part of the Invincible Universe genre rules, battles between beings such as the Viltrumites result in a lot more collateral damage than typical superhero fights. To simulate these devastating battles, a modification of the Knockback rules is necessary. When a character is Knocked Back into an inanimate obstacle such as a building, the obstacle is attacked with an AV/EV equal to the EV of the original attack, not the distance of the Knockback. Writeup completed on the 7th of September, 2013.